Blognonymous : Why Do Women Take Them Back? This post was submitted to me within the ethos of Blognonymous. A fellow blogger asked if she could post this here as it didn't feel right on her own blog. I respect her decision and realise that it could be a difficult read for some people. 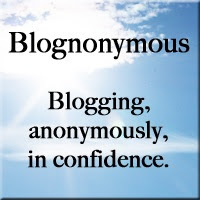 If you would like to offer any kind of support in the comments but prefer to remain anonymous yourself then there is a "guest comment" facility - sign out of Disqus (if you have used it before), write your comment, click "Post as..." and you will see "guest" appear as an option. If you would like to contact the Blognonymous team please click on the image to the right for more details. I will start by saying I know not all victims of domestic violence are women, buy the majority are and it is my experience as a women and of my peers I am writing about. Every time I hear the name Chris Brown it reminds me of my 'story' as the only thing I can ever associate with him is him doing this to Rihanna. In recent months there has been the celebrity gossip sites talking about the pair of them getting back together and the majority of people wondering how she could do that. What people don’t realize that for women in a relationship with a person who abuses them verbally, emotionally, sexually or physically is that bit is only part of the relationship. It isn’t ALL of it. It can for some be a really small part that happens on a Saturday night after too many beers, or when things aren’t quite going well at work, when you are pregnant, or when you just said the wrong thing. But the rest of the time things are good, you work hard to have a normal life and to be just like any other couple. So when things happen you can compartmentalize them into that section of your relationship, just the same as another person who get annoyed at their partner who doesn’t take the rubbish out. It isn’t a deal breaker. But then one thing will happen and it becomes a deal breaker, something gets broken, a face, a lamp, things go further than before, a child becomes involved. Whatever the thing is, that is enough and the button is pushed and you leave. But for many that isn’t it, and this is the bit that society struggles to understand. How can you go back, forgive and allow them to do it again. If you have chosen to be in a relationship with someone, and fallen in love with them then you tend to fall for the whole person, warts and all. If they are an abuser it is often as I said that is just part of the relationship and although you hate that part with every bone in your body that is not the person you fell in love with and want to be with. And the person you get back with is the person you fell in love with, not the abuser. Without even getting into the deeper example of how clever these abusers can be and as it was explained to me ‘it’s like they have a rule book they all follow’ that some scheme and plan their way back. Some of course are genuinely sorry, and they are often sorry the next time, and the time after that. I am not going to deny that there are people who snap and hit/abuse once and never again. They recognize the issues and are sorry and get help. But that is minority, the majority get worse as they are able to as we the victims stay and accept their behavior. We stay as we hope it will be the last time, we stay as intelligent women believing that small fault in their personality will fizzle out, we stay until the button flicks for the final time and it really is enough and then we leave. But that is not the end of it, years later we still question it all, we find old emails from when we fell in love and all the good comes back to us and the bad is forgotten and we think for a bit, it wasn’t that bad, I was being dramatic, it wasn’t domestic abuse, he was just cross. When I tell my story people have never failed to see that I was a victim, and that I was brave to leave. 3 years on most of the time I still feel stupid for being there at all and not leaving the first time. But mix that up with knowing why I stayed and it is just a mess in my head.